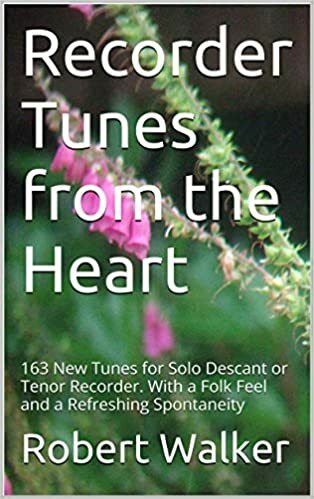 This is my new kindle book of tunes: "Recorder Tunes from the Heart: 163 New Tunes for Solo Descant or Tenor Recorder. With a Folk Feel and a Refreshing Spontaneity "
163 Tunes for solo descant or tenor recorder. Many composed out of doors, and noted down quickly with few or no changes. The idea was to compose more and more spontaneously, like the way many Impressionist painters painted, and the way Japanese and Chinese calligraphy is done, and also the way birds sing. When you buy the book, you can then download the tunes as a pdf for printing out, e.g. to put the music on your music stand. You can also download them in abc notation (which lets you customize the score, e.g. add annotations, and also preview the music in midi format which can help with tricky rhythms). Can be played on other recorders, by reading the score as for a descant. Also because of the recorder's small range, they should be playable on any melodic instruments with two octave range from middle C.
WANT TO HEAR WHAT THEY SOUND LIKE? I wrote these after my mother died, staying in the house she lived in, so she was an inspiration for the tunes. So I dedicate them to her. It has full Flamenco rhythm circle options, African drum beats, Afro-cuban beats, all varieties of polyrhythms, and novel things like rhythms connected to the harmonic series. It is quite simply the most remarkable software for rhythmic music study.